Only one day earlier‚ the home of the Hag'avi family was demolished by a direct hit of a Kassem rocket. The home was completely demolished. 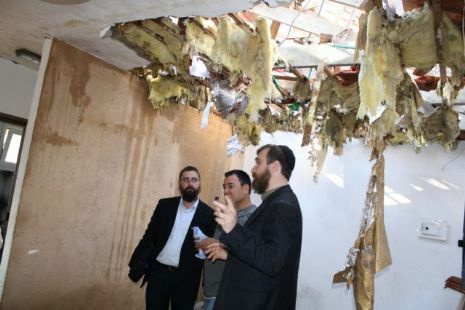 Only one day earlier, the home of the Hag'avi family was demolished by a direct hit of a Kassem rocket. The home was completely demolished. The landlords stand in the yard, looking at the ruins and crying. Just on time for Purim, a delegation of the Chabat Terror Victims Project visited them together with a group of friends from the U.S.A. The delegation gave the family emergency funds for their immediate needs. Family members told of the great miracle that not one of the family members was injured physically. They proudly showed a picture of the family patriarch, a great Rabbi in Yemen, whose picture remained hanging on the one of the walls which caught many fragments, and showed them how the area surrounding the picture wasn't hit. In the spirit of the month of Adar, the Shluchim spoke with the family about the strength of joy which exceeds all bounds; read together Tehillim and put on Tefillin, while the whole delegation burst into dance with the landlord in the center of the circle dancing on the ruins of his home, thanking G‑d for sparing his life, hoping and praying that joy and blessing will return to his home.